As someone who doesn't drink wine there is a definite lack of 'sophisticated' alternatives. When approaching the alcohol free side of things the pickings become even slimmer. Everything seems to want to be an apology to the fact that you don't have the real thing. Here we have something a bit more authentically grown up and stylish. Ok - maybe not in the hotel room next to the Coke bottle for scale. The larger bottle certainly does have more elegance. 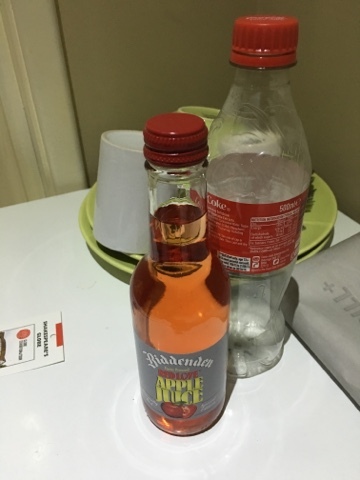 This is 'Red Love' apple juice and doesn't seem to have that much tampering with it. 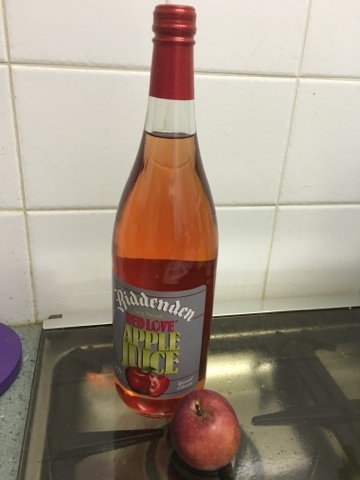 The ingredients certainly are just apple juice and things to help it survive. I do think that coming from a proper drinks company there is some wizardry going on as this has an interesting flavour. It's crisp and refreshing as you'd expect, but there is a definite strength there too. I took the small version out with us as I thought it would be good to savour and I was right. I think I may have to save the big bottle for Christmas Day. Rose wine is becoming increasingly popular and trendy, I think that a bar that cottoned on to this idea of high end fruit drinks could have the perfect alternative for those of us who prefer to avoid alcohol. Unfortunately this is one of those cool, small, local pick ups that you have to hunt for. You can pick it up direct from the vineyard (http://biddenden.myshopify.com/collections/juices) online, and from farm shops in the area. I think the effort required in hand sourcing vintage fruit juices would only add to the appeal of the collector, although possibly a fruit cellar may not be quite as effective. Something to savour and to share, and certainly look forwards to with my Christmas dinner. A big hit.